Mara G. Haseltine was commissioned to create Follicle Stimulator Hormone (2004) by the company Serono located in Geneva, Switzerland based on the ribbon diagram depiction of the follicle stimulator hormone. The work celebrates 30 years of outstanding work by the scientist Aliza Eshkhol. Eshkhol did groundbreaking work on the purification of the Follicle Stimulator Hormone in 1961 which is now sold by Serono as Pergonal, a fertility drug which has helped thousands of pregnancies. Aliza’s work was pivotal in creating the some of the first bio-engineered medicine on the market. 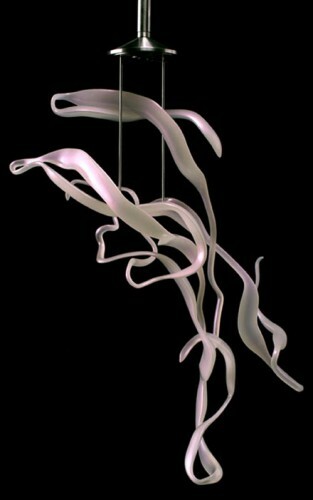 To create this sculpture the artist utilized a unique technique she has developed in which she uses accurate sub-molecular data as the armature for her work which she then contoured in the computer and realized in three dimensions via stereo lithography. Materials: SLS plastic, autobody paint, metal.